Home / Uncategorized / What’s App? 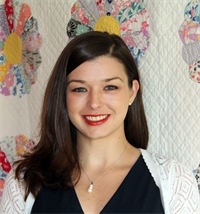 Although Quilts Inc., the entity that holds the trade shows for the quilting industry, has had an app for its events since Fall 2013, the Market app was always in flux and sometimes didn’t suit all mobile devices. The learning curve for developing an app for such a huge event and helping sometimes not terribly tech-savvy show attendees navigate the event has finally smoothed out. The Spring Quilt Market app looks like a winner! The app is now easier to download and use, works on all mobile devices as well as a website, and is available through either the Apple Store or Google Play. 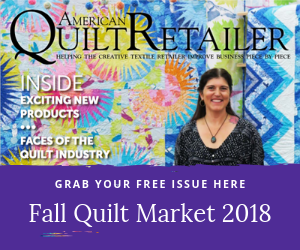 If you plan to attend Quilt Market by yourself, you can certainly simply download the app to your smart phone. But if you’re attending with employees in tow, it would be a good idea to download the app to a tablet. That way, more than one person can view the maps and instructions and your group can plan what to do and where to meet. The all-important credential requirements are also listed on this page and a complete schedule of Quilt Market events. Speaking of events: there’s a category for Schoolhouse, the sampler-type sales presentations that take place prior to the Market opening. All Schoolhouse sessions are listed by time and location as well as the title and sponsoring company. Under Classes/Events all the Take & Teach sessions, hour and a half how-to classes, are listed as well. The Map section of the app is a godsend for those of us who are directionaly challenged. If you ask a local for directions, remember that every route in downtown Salt Lake is given in relation to the central location of Temple Square. And the convention center is a 10-12 minute walk south and west of Temple Square. The Show Map is a layout of the convention center itself and will be invaluable as you plan which exhibitors to visit and as you search for the nearest rest room. Don’t think that downloading the app will give you every iota of information you might need at Quilt Market. One detail missing is noting which exhibitors are new at this Market. Experienced Market attendees know to search out the newest exhibitors first since bright ideas often come from fresh faces. That info is still in the printed program. Although the Exhibitors section lists each company’s website and phone number, there’s not an in-depth explanation of what goods/services each exhibitor offers. Since our industry adores cute names, you’re still going to have to refer to the printed program to find out what “Miss Bunny’s Farm Frolics” actually sells! When you click on the names of some exhibitors (especially pattern designers) practically all their products show up. But, many fabric companies withhold images of their brand spankin’ new lines since they want to make a splash at Market. You still need to visit the fabric companies’ booths to see the newest prints. Don’t wait until you get to Quilt Market to download the app: do it now. Look over the information and get your game plan in place. If you like to post on social media while at Market, tell your peeps to watch your shop’s Twitter account. Twitter is listed on the Quilt Market app but neither Instagram nor Facebook since neither is app-designer friendly. And if you’re in the habit of being online 24-7, know that WiFi access at the Salt Lake convention center costs $15 a day per device. But, here’s my freebie tip of the day: there are some free WiFi spots at the convention center–try the meeting rooms and the lobby areas! Looking forward to all of you stopping by the AQR booth (#1924). Talk with the staff and let them know what you think of the magazine and the app!